MHG Heating has supplied two ProCon HTP gas-fired condensing boilers with integral plate heat exchangers to Fibercore’s optical fiber manufacturing facility in Southampton. Fibercore is a manufacturer of specialty, high specification glass optical fibers. The company therefore requires close temperature control in the Class 10,000 clean rooms where the fibres are manufactured. However, the existing boilers were proving unreliable so the decision was taken to replace them. The new boilers were specified and installed by Accolade Building Care, the special works and service & maintenance division of Accolade Building Services Ltd, based in Ringwood Hampshire. As well as providing greater reliability the ProCon HTP boilers will deliver significant energy-savings. Exploiting the circa 95% energy efficiency of the new boilers, the two older 200kW boilers have been replaced with 2 x 150kW models. 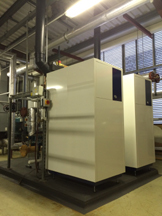 The ability of the boilers to modulate will help to maintain efficient performance as heat loads vary. “Being ISO14001 certified, and having been awarded a Queen’s Award for sustainable development, means Fibercore is committed to minimise its environmental impact through energy efficiency and other measures, so the efficiency of the boilers was a key consideration,” explained Fibercore Engineering Facilities Manager Peter Maton. “We anticipate around a 20% reduction in gas consumption and associated carbon emissions from this boiler upgrade,” he added.